SmartCodeComponent allows you to easily add professional quality bar codes to Office documents like those from Word and Excel. It is extremely powerful, utilizing the same engine as SmartCodeStudio, the industry leading and award-winning label design / barcode software. SmartCodeComponent will work flawlessly with any Windows application that supports OLE (Object Linking and Embedding) Server. This includes most (if not all) Microsoft Office products, WordPad and many third-party softwares. Simply insert SmartCodeComponent into your application and select a few bar code properties, such as bar code height, bar width, barcode type and bar code orientation. Your desired bar codes will be generated automatically. SmartCodeComponent exposes a full range of barcode properties and allows precise control over barcode dimensions. The font for the human readable text is customizable, and support for various barstyles allow the text to be placed on top or below a barcode symbol. The text can also be left-aligned, centered, or justified. Data validation is also carried out over all input to ensure the generated barcode meet industry specifications. SmartCodeComponent supports all commonly used bar code symbologies including : Code39, Code128, Code128A, Code128B, Code128C, Code39ASCII, Interleaved 2 of 5, ITF14, EAN13, ISBN, ISSN, UPCA, UPCE, EAN8, UPC Extension 2, UPC Extension 5, UCCEAN128 (All industry Application Identifiers like SSCC-14, SSCC-18 etc. ), Code93, Rational Codabar, MSI (Modified Plessey), Standard 2 of 5, RSS 14(Reduce Space Symbology), RSS Stacked Omnidirectional and RSS Limited. 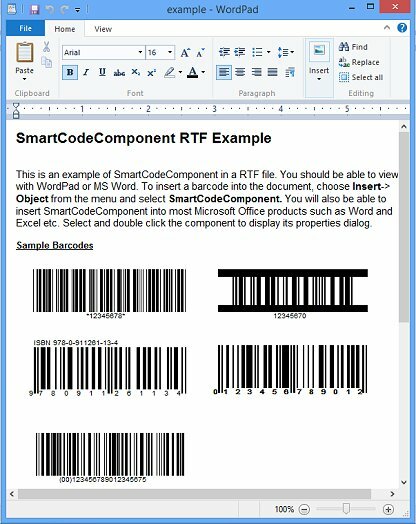 SmartCodeComponent includes a standalone MetaFile Creator that can be used to generate Windows Metafiles and Images of barcodes for use in third party applications. In this release, advanced users will find it easier to automate the generation of barcodes within Excel using several new methods that are exposed to VBA. Barcodesoft PDF417 Premium Package empowers you to print PDF417 barcodes from desktop printers. It is able to encode ASCII and extended ASCII characters.There are 9 fonts, a crystal reports UFL DLL and a GUI encoder included in the package. This site does not contain serial number, crack, keygen SmartCodeComponent serial number : serial number is the simplest type of crack. A serial number(cdkey,product key,etc) is register the program as you may already know. a crack or keygen may contain harmful software. If you cannot find the exact version you want, just give it a try. for more information read .nfo/.txt/.diz file include in zipped file.